Australia Spoke. Cirrus® Listened. The All-New Special Edition Australis™. 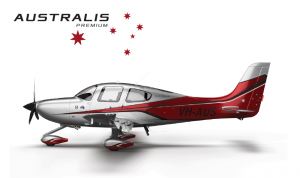 Cirrus Aircraft today announced the 2015 Generation 5 SR22 Special Edition: Australis. Thoughtfully designed and configured for the Australian market, the Australis is tailored specifically to the climate, conditions and remote area flight operations that pilots in Australia regularly experience. The Australis has been precisely configured and designed with features specific to the needs of the Australian pilot. In addition to the trademark Cirrus Airframe Parachute System™ (CAPS™), air conditioning and specially treated UV windows are standard on every Australis. The UV protection has been shown to reduce solar energy by up to 30 percent, keeping the cabin cooler on the ramp and protecting both the occupants and interior surfaces from UV exposure. Standard accessories include a 4-person survival bag, personal locator beacon, claw tie-down system and a two-year AVPLAN subscription. The Special Edition Australis will make its debut at this year’s Australian International Airshow and Aerospace and Defense Exposition – AVALON, in Geelong, Australia, from 24 February through 1 March 2015. Cirrus Aircraft will be located at booth #EW7. For more information about the aircraft and its current availability, contact Gold Coast based Cirrus Aircraft Regional Director, Graham Horne at ghorne@cirrusaircraft.com. Cirrus Aircraft is a recognized leader in general aviation. Its all-composite line of personal aircraft – the SR20, SR22 and the turbocharged SR22T – incorporate innovative and advanced performance, electronic and safety technologies, including Cirrus Perspective™ by Garmin® avionics and the unique Cirrus Airframe Parachute System™ (CAPS™). To date, total time on the worldwide Cirrus Aircraft SR-series fleet surpassed six million flight hours with 104 lives saved as a direct result of CAPS being a standard safety feature on all Cirrus aircraft. The Cirrus Vision SF50™, with over 550 production positions reserved, will provide a new personal and regional business transportation solution: the personal jet. All Cirrus aircraft are made in the U.S. with a direct sales force in North America and authorized sales centers covering export markets in 60 countries around the world. Cirrus Aircraft is wholly owned by China Aviation Industry General Aircraft Co., Ltd. (CAIGA). Cirrus and Cirrus Aircraft are trademarks of Cirrus Design Corporation d/b/a Cirrus Aircraft. All rights reserved. For additional information on Cirrus and its products please visit cirrusaircraft.com.